The Smart Tag of RadDock lets you quickly access common tasks like adding windows to several positions. Theme Name: Select a theme name from the drop down list of themes available for that control. Selecting a theme allows you to change all aspects of the controls visual style. The following article shows how you can add themes: Using themes. 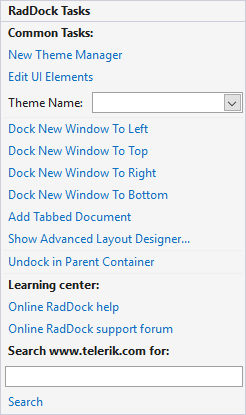 Dock New Window to Left/Right/Top/Bottom: Adds new ToolWindow to the specified position. Add Tabbed Document: Adds new DocumentWindow. Show Advanced Layout Designer Opens the layout designer.